last Sunday I shared a pulpish creation of mine that dates back to 15 years ago, MAX MALONE: I was wondering if I should take it to the next step and have it developed in the form of webcomics and you guys seemed excited about that idea. Well, diggin through my things, I found this other guy I came up with about 3 years ago, BLACK BEETLE. Where MAX MALONE is more a sci-fi pulp noir, this is more in the vein of masked vigilante pulp in some sort of '40s/'50s settings, with some slight (40s/50s) sci-fi tone to it. Here's another teaser for Black Beetle and look for more Max Malone later today or tomorrow. So, the news is finally out, even if was half hidden in a small blurb (about the recent Phoenix Con) on the Newsarama blog. I can finally reveal what I have been working on since beginning of the new year (and still working on it as I type this): it's GARRISON, a creator-owned 6 issue mini from Jeff Mariotte and me that will published by Wildstorm pretty soon (I hope ;)). The pitch? In Jeff's words: "It's a near-future action epic about the most dangerous man in the world, Lester Garrison, who happens to look like someone you'd find at the tractor pull on Friday night." Jeff is not kidding when talking about action: I think it's the most action packed book I have drawn to date (and my past books had lots of action in them anyway), plus other cool, noirish, and hi-tech elements related to a colossal manhunt. I remember creating Max Malone for a monthly magazine: it's gonna be harder try to find all the character sheets and concept art, but now that I look at it, I may try to give it some new life (see new logo above, i.e. ), maybe as webcomic? What you guys think? The original story was inspired a bit by Blade Runner but I think I will change that if I give this another go. Apologies for the italian balloons, which I drew straight in the pages, but I hope the action reads well anyway. No, it's not the classic movie with Paul Muni (even if it's on my list of things to tackle here at Pulp Sunday) or the remake with Pacino either. What I am referring to here is Gonzales who now shows quite a few scars after his last meeting with Zorro (issue 8). Well, he will be back in issue 12, uglier than ever, but you can take a peek at his ugly mug on the back cover of the current issue 11 of Zorro which comes out today in the stores. I will be back drawing interiors on the third arc: stay tuned for more details and sneak peeks. I wanted to share just some concept art I did for a short story I am writing. More about this soon, hopefully. 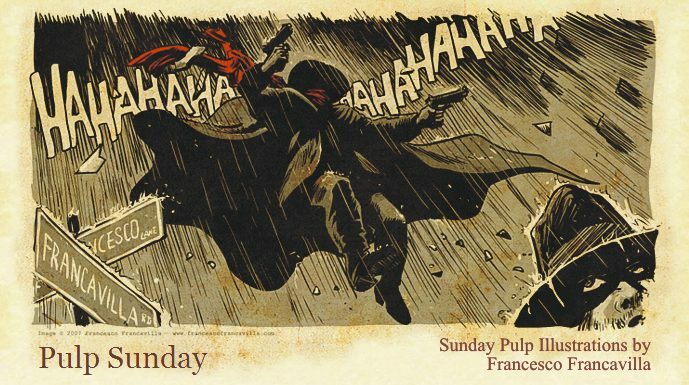 Meanwhile I wish you all a wonderful Pulp Sunday. Continuing my take on the golden age Minutemen, here's the Comedian. While preparing to go to watch the movie myself (probably this weekend), I thought to pay tribute to some of the Minutemen: here's the Hooded Justice to start with. Hope you guys dig it. "His Mom always said they'd rot his brain. But Stevie was crazy about comics. for the the chance to get more of the darn things. Like accepting a ride from a stranger.". This week I will be posting something everyday, either a concept, a sketch, a sneak peek, a tribute, something from past projects, some from future stories, you name it, and all will be unmistakanbly pulp. Today's episode of the SHadow has all the elements of those exotic mystery tales: a vulcano island with natives, drums beating and fires going by night, people disappearing (usually a couple, a man and a woman, every year during Girmet, "The Night That Eats Men"), human sacrifices, and, of course, The Shadow finding out if all this is really about a primitive god or something much more "material".